Naumann, S., Brosch, U. & Nässig, W.A. 2003. 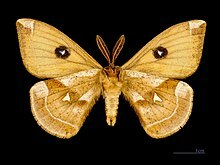 A catalogue and annotated checklist of the subfamily Agliinae Packard, 1893 (Lepidoptera: Saturniidae). 1. Review of the Aglia species with description of a new taxon from Sichuan, China. Nachrichten des Entomologischen Vereins Apollo 24(4): 173–182. Full article zobodat (PDF). Reference page. For more multimedia, look at Aglia tau on Wikimedia Commons. This page was last edited on 23 March 2019, at 02:54.